Info "They're gumming up the plumbing." Mario Bros. is a microgame from 18-Volt's stage, appearing in WarioWare: D.I.Y. Showcase, based on the Mario game Mario Bros. 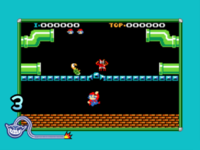 The player must flip the enemies on screen (Shellcreepers and Sidesteppers) by making Mario jump under them by clicking at him. While the Shellcreeper must be hit one time, Sidesteppers must be hit two times. If the player doesn't hit all the enemies, they will lose. This page was last edited on October 8, 2018, at 22:42.